Baby Physics Law #1: The smaller they are, the more stuff they need. Britton has been showered with love in all forms since the day we found out that we were expecting. Since she's been here, we've gotten to test drive so many things. Some have worked out better than others, and some have been absolutely indispensable. Since I don't have a picture of us, you get treated to a stock photo from BabyKtan.com. Baby K'tan. I love scarves, headbands, earrings, and necklaces--if you can find an accessory, chances are I will love it. It's no small wonder then that I was drawn to the woven wraps and carriers that are so popular for babies these days. After researching the available baby carriers, I decided that dealing with the super long fabric of a Moby-type wrap was more than I could handle, and that the Ergobaby was comfortable but a little more than I wanted to spend. In my research, I found the perfect solution for Britton and I: the Baby K'tan. It comes in a bunch of colors (which appealed to my accessory-loving self), and it was made of soft fabric. It was easier to put on and use than a traditional style wrap, but I knew it would still be comfy for baby Britton. And instead of the $100+ that the ErgoBaby commands, the K'tan was about $45. I practiced on a baby doll before Britton arrived so I would be familiar with the types of holds: there are many, many helpful videos on the Baby K'tan website and YouTube to guide you through the multiple ways to wrap the K'tan. Britton LOVES the K'tan, and we use it regularly when we're out on shopping trips. I sometimes wear it around the house when I'm doing my freelance writing work or chores. When she was super tiny, I would put her in the kangaroo carry and she'd fall right asleep while I worked. Now, she loves the inward facing and outward facing carries, and will gladly stay in either for quite some time while I'm working or shopping. All strapped into her car seat and stroller and ready to go for a walk! The Graco LiteRide Stroller in Zooland. At first, I didn't want a stroller (all of you experienced moms can go ahead and get a good laugh out). I figured that the Baby K'tan was versatile enough that I wouldn't use a stroller. Luckily, my mom insisted on buying the Graco stroller to go with the matching car seat we already had. I love being able to snap Britton in the car seat, and then quickly click her into the stroller when we get to the mall or the grocery store without taking her out of the seat. It's especially helpful when she's sleeping, and taking her out to put in the K'tan would wake her up. Plus, the stroller's really easy to break down and put in the trunk, which is awesome for a complete weakling like me. We also have a running stroller (which we also love) but that one is so much heavier and not really great for quick trips in and out of the store. "Just five more minutes, Mama!" Luv 2 Zoo Bouncer. This is Britton's new favorite thing. She could spend HOURS in it. One time, she actually fell asleep in it--I noticed that she was being very quiet all of a sudden, and when I turned around, she had her cheek propped up on the edge of the seat. She bounced herself to sleep! There are three different stations on the bouncer, and the seat rotates 360 degrees so she can access any of the toys when she wants. At 5 months old, she was about 24" tall, and she could juuust touch the floor with her toes. To make it easier for her to bounce, we put a little box under her feet. Now, at almost 6 months old, she doesn't need the box. The bouncer has three different levels so it can continue to grow with her. Nuby transition bottles. We started off with the Medela bottles that went with the manual pump I got because I (erroneously) thought we'd only occasionally need to bottle feed Britton. Her voracious appetite led her to discover how to drain those in just a few minutes--she already has issues with spitting up all the time, and the gulping of her milk wasn't helping. We tried pausing during her feedings so that she was forced to take a breath, and that helped space the feedings a little. When she was about four months old, however, she had enough coordination to try and hold the bottle during feedings; Landon and I quickly found that fighting Britton for control of the bottle on top of attempting to pace feedings was too much. If Britton wants to help feed herself, then we'll help her make that happen. We got the Nuby transition bottles, and she immediately took to them. I love that they can be used as a regular bottle, a handled bottle or a handled sippy cup, which will really make the transition out of a bottle easy. The First Year's Infant to Toddler Tub with Sling. It's safe, it fits in the sink, and it has a removable baby sling. Plus, it's lightweight, sturdy and inexpensive. What else could we want in a baby tub? Mesh Crib Liner. When she was a baby, Britton constantly would wiggle in a corner and get her foot stuck in the slats since we didn't put up a traditional bumper. This would wake her (and us) up, and in an effort to ensure that we all got more rest, Landon and I went on the hunt for a breathable bumper. This one worked beautifully; Britton no longer gets her feet stuck, and I can sleep easier knowing that this type of bumper doesn't increase the risk of SIDS. Infantino Vented Carrier. This is Landon's carrier of choice. The K'tan (my carrier) comes in sizes, and there's no way that Landon was fitting his shoulders in my size small carrier. He had to decide between getting a second K'tan or getting a harness type carrier (the Moby style wraps weren't even a consideration in his book). He found this carrier on Amazon and really liked it; he actually uses it, and Britton likes riding in it, too. It's great for keeping her close while doing chores, and Landon likes to wear it when he and Britton are on their own while shopping. It's adjustable, which means I can wear it too! Baby Trend Jogging Stroller. We've only gotten to use this a few times since Britton has only recently gotten complete head control (which is necessary for riding in any stroller without an infant carrier attachment). Landon is the runner of our family, and he says that the stroller works like a charm when he, Britton, and our dog Phoebe are out on jogs. I've taken it on a couple of walks, and the stroller is extremely easy to push; I also like the two cup holders. It's a bit bulky for quick runs to the grocery stores, nor is it compatible with the Graco car seat we have, and that's why I've used the Graco (above) more. 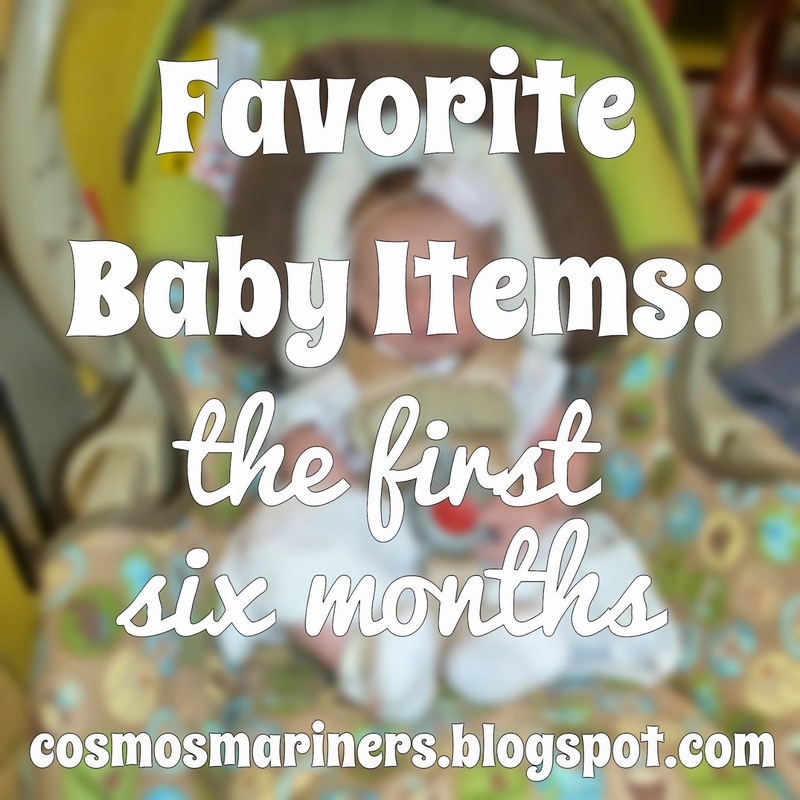 Experienced moms: what were your favorite items in the first six months? What should we look to get for the second six months?